When you are looking for solutions to extreme demands on people and machinery at work, you can rely on Volvo, the makers of the world’s most popular compact excavators. With its redesigned cabin, the Volvo EC55C matches greater power and performance with class leading comfort. It is an unbeatable combination. The new EC55C features one of the highest break-out and tear-out forces in its class. Thanks to its advanced boom and attachment geometry, this power-packed compact lets you stretch further, dig deeper and reach higher. Volvo has developed proven technology by shortening the bucket and tipper dippers to gain greater ripping power, with the articulated boom extending its reach in every direction. As a result, the compact EC55C will size up to any task from picking and sorting to top loading the very largest dump trucks, effectively and fast. 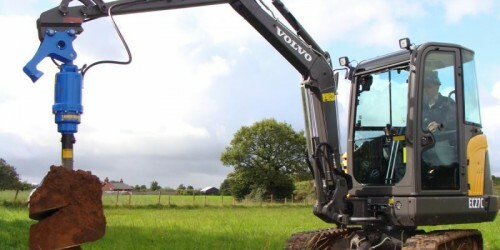 Volvo has harnessed the high performance of the EC55C to give enormous traction power on site. It will get there faster too, thanks to a 10% increase in travel speed. When excavating, the bucket swivels to bite hard and square. Fully loaded, even at maximum height, it stays tight closed to firmly hold material in. So whatever the job in hand, you have all the power and performance that it takes to tackle any terrain, including rutted ground or slopes. Sheer power and smooth hydraulics deliver exceptional performance with no compromise on safety. The simultaneous control of slew and offset movements through a more intuitive interface extends the scope for faster, safer performance, even in confined spaces and slopes. Rotating the hydraulic angle blade saves more valuable time by eliminating the need for repetitive repositioning on site. And because the blade is now positioned further forward, the articulated boom can reach it more easily, enabling the bucket and blade to work more precisely together. Whether you are looking for great allround performance or just exceptional choice, the EC55C gives you the best of both worlds. Volvo’s new pin-on attachment bracket enables accessories such as the bucket or Volvo thumb for picking and sorting to be switched fast. Thanks to the identical end-of-dipper interfaces on ECRs and conventional Volvo excavators of the same weight, the entire range of Volvo standard buckets, grippers, sorters and rotators are easily interchangeable. So now you are even more certain to find the right tool for the job. 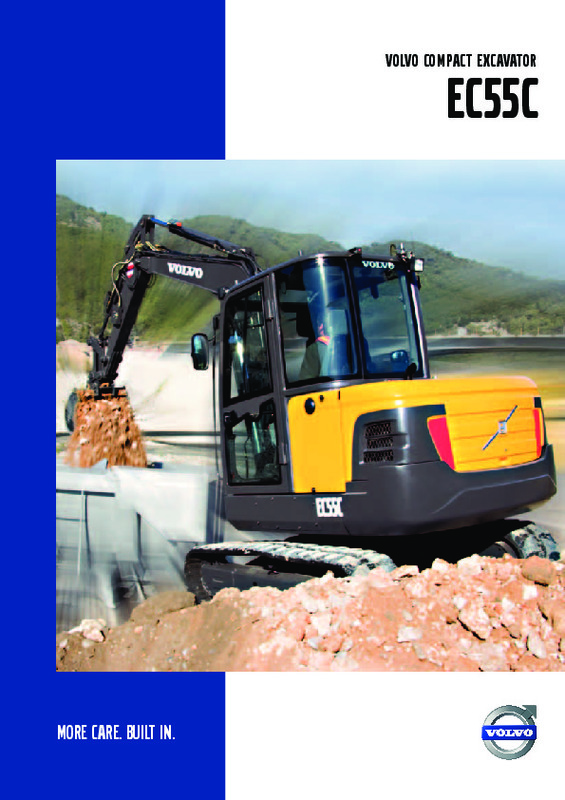 Download the EC55C mini digger brochure, including specifications. Do you need spare parts or accessories for Volvo EC55C Compact Excavator?